Yes, you heard me! Sympli has been working together with Atlassian's Solution Partner Program to integrate Jira, the #1 tool for development teams that need to track issues with minimal stress, allowing them to ship early, and often. 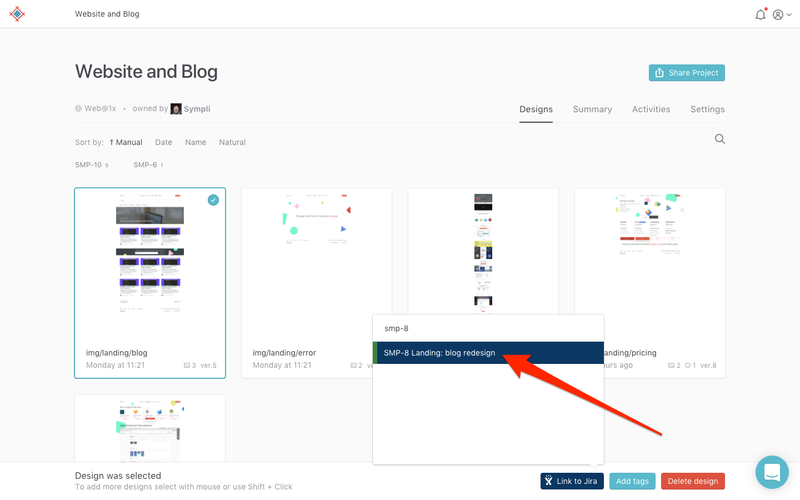 As they say, when a task begins to feel a little overwhelming, it's best to break it down into smaller steps, and that's exactly where Jira comes into it. Our new Jira integration is an enterprise-only feature, and will be included in our revamped and remastered enterprise plan. 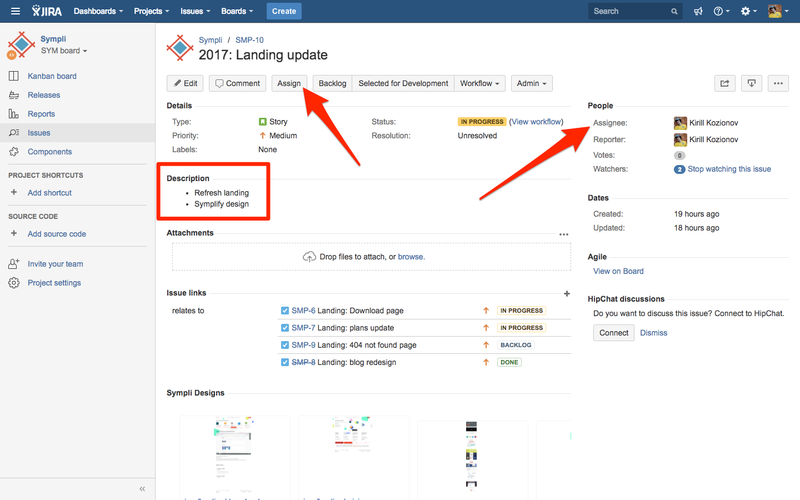 Bringing Jira into the design and development workflow is fairly easy, but let's walk through it anyway. Before we can learn about a new feature, we first need to understand who it's been implemented for, and how they can benefit from it, so let's briefly run through some use-cases where a Sympli-Jira integration would be useful. A user explains (in Jira) that it's a little difficult to accomplish something on a website, as it's not clear how the user should do it. 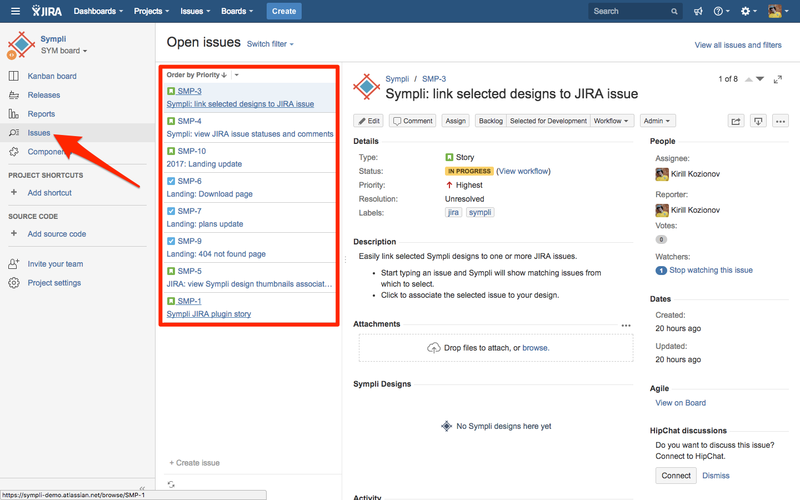 An export of the relevant screen(s) are sent into Jira (from Sympli) so that the user can better explain the specific issue that they're having, with added context. In a similar fashion, a designer reports that they encountered an error while testing the website. A screen exported from Sympli would further illustrate where exactly this error occurred, and what the steps they took to encounter that error. A developer can then be assigned to the Jira issue to fix it. A developer suggests, that a feature to be implemented doesn't really work practically, as it would be difficult to code. Again, their notes would complement the screens that have been sent over from Sympli. Jira functionality can also be extended with Jira apps, so annotating exported screens is something that's doable as well, to add further clarity and context. As you can see, Jira is for everyone. It's relatively straightforward to see which issues have been assigned to you, and it's also intuitive in the way that you can specify whether an issue is a bug, task, subtask, new feature or improvement. Responsible team members are made accountable, and nothing (or nobody) is left in the dark about how a design is evolving. 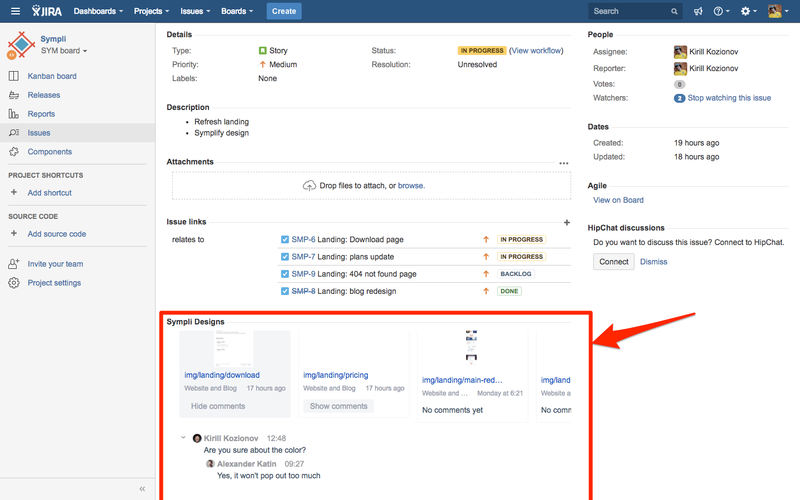 At any moment in time, Jira makes it easy to see what needs fixing, what features are still in active development, and who is responsible for those things. Let's take a look at how it actually works. Start by navigating to/hovering over a Sympli "Project" and clicking on the tick icon to select a screen (or multiple screens). You can also use the standard shift+click keyboard shortcut, which is quicker. After that, click "Link to Jira". Pretty straightforward stuff so far. After that, begin typing the name of the issue that is currently being tracked in Jira, and then select the issue from the list of results returned in the box. You can link screens to as many tracked issues as needed, as normally, there'll be numerous issues to track on different aspects of the same screen. 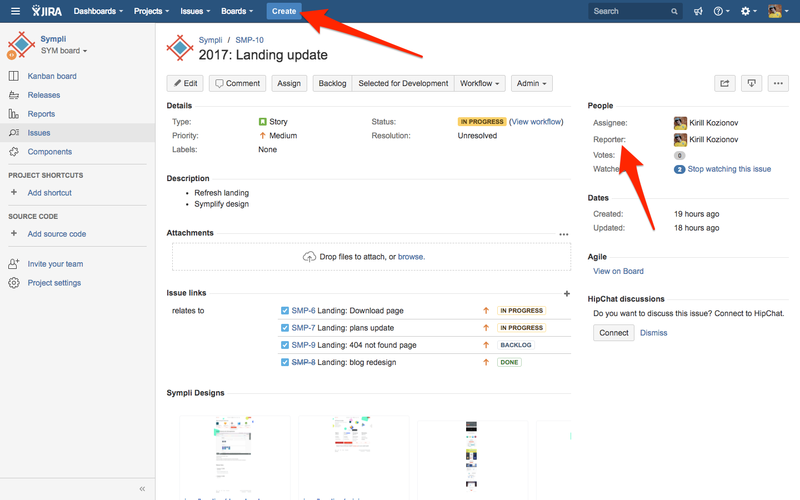 Here's the actual issue as it appears in Jira, after the "reporter" has created it by clicking the "Create" button in the Jira top-most menu. First, the team member who is responsible for fixing/taking care of this issue is listed as the assignee. In this case (below), our designer Kirill has been asked to give our landing webpage a beautiful redesign (which he did!). So that vital tasks are taken care of first, a "Priority" label is assigned, and a "Status" label also, so that we can track what issues are still "open". Everybody understands how far along we are with issues, and the design as a whole. As you can see, our landing webpage is "In Progress"! And finally, here are the screens we sent over from Sympli. 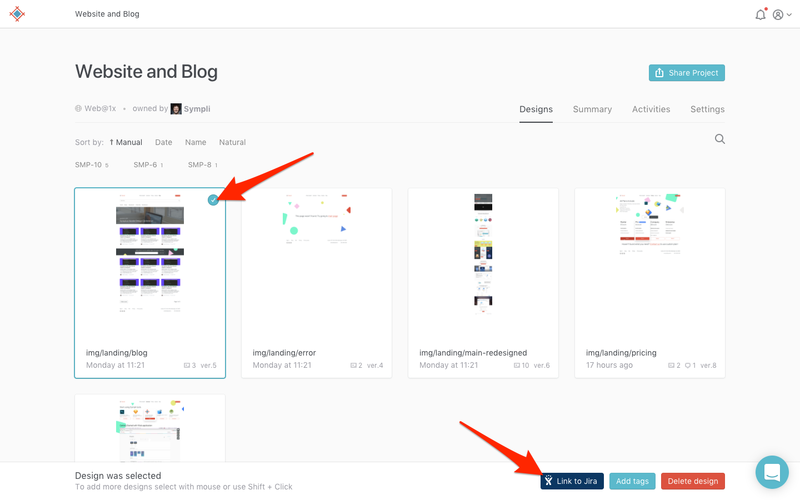 Not only can we view them, for added context, but any comments made via Sympli will also appear here. This is to reduce latency and aid collaboration, making sure no communication goes unnoticed, regardless of where teams are actually making their comments. All issues are tracked from the "Issues" tab in the sidebar. 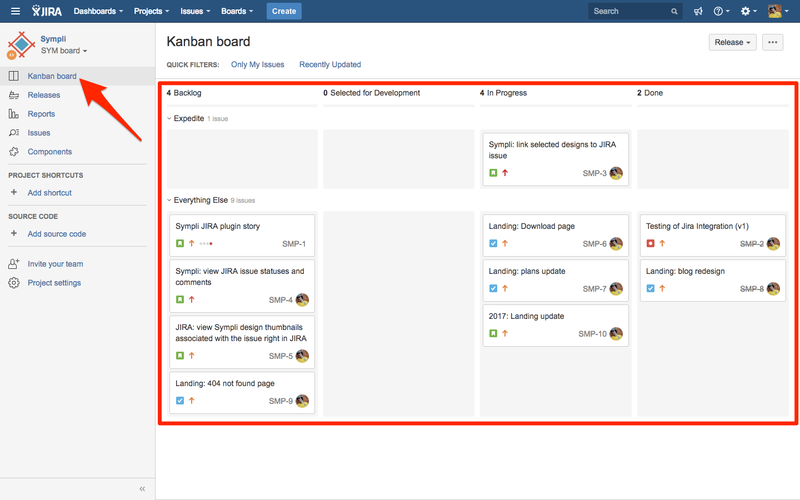 Alternatively, you can use the "Kanban board" overview, if you're more accustomed to a Trello-style workflow. 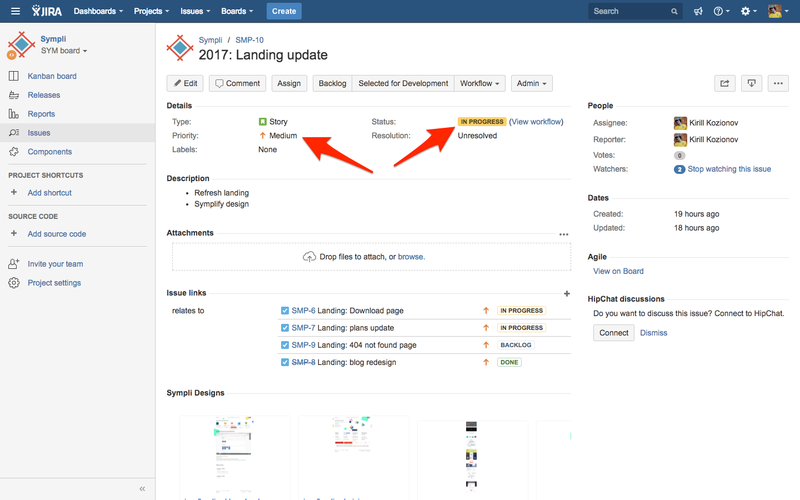 Jira adapts to your team! The Jira integration is part of our Business and Enterprise plans, reach out to us at sales@sympli.io if you have any questions about our pricing tiers.